There are many different poker tournament structures and each one vary in limits, the structure of the blinds and actual format of how the tournament. Understanding the differences will ensure that you are prepared before you buy in to the event. Tournaments form a huge part of the online market, a market which is currently expanding and an massive rate. A tournament offers up the chance to buy in to an event and win a large sum of money by making it to the money. 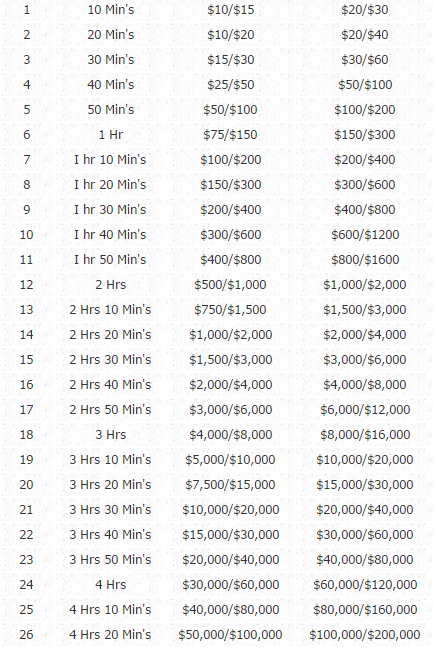 In most events, the pay outs will usually be split between the top 20% of finishing places. First place usually receives between 22 and 30% of the total tournament prize pool - one of the many attractions to tournament play. To gain entry to a poker tournament you will need to "buy in". The concept of a buy in is exactly as the name suggests. The "buy in" will get you entry to the tournament and acts as a purchase for your starting chips. This will usually get you 1500 chips, although it will be 2000 or 3000 or 10,000 in some larger deep stacked events. Every tournament has blinds (big and small blind) that need to be posted throughout the event. These are automatic bets which have to be made and ensure there's something to play for. In each round of betting 1 player will have to cover the big blind (first automatic bet) and 1 will have to cover the small blind (second automatic bet). The "dealer chip" passes round the table continuously and indicates who has the big and small blinds (first 2 players left of the dealer chip cover blinds). The dealer chip moves round the table clockwise. Throughout a tournament, the blinds increase steadily, usually over 10 minute intervals, although this can very depending on the format being played. The figures below indicate how the blinds structure increase in a typical poker tournament.. When playing online, it is a good idea to make sure that you look at the tournament format to make sure there are no surprises when play gets underway. Below, we cover some of the more popular formats you will come across. Knock out tournaments are very common in online poker. Each player, after paying a "buy in", gets a set amount of chips and players are spread at random amongst as many tables as it takes to seat everyone (not exceeding 10 players per table). From this point play starts and as players are knocked out, remaining players are shuffled around to balance the remaining tables. In the later stages of a tournament, you run a greater chance of being knocked out if you don't play enough hands, as the blinds increase and start to eat into your stack by greater and greater amounts. As play continues, there are more and more players trying to steal pots with marginal hands as the need for chips increases. You will very often see all in moves with more marginal hands, in the later stages of a knockout tournament. Of course as the event progresses you will need to loosen your starting hand requirements - you don't have time to sit and wait for monster hands. Players will continue to get knocked out until ten players are left and the play moves to one table - the final table. This is where the real money starts. From there poker is played until one player has all the chips, a winner. Progressive knock outs are a new and exciting format. The concept is simple. Half the buy in goes to the prize pool and half goes towards a players bounty. If the buy in is $200, $100 goes to the prize pool and each player has $100 on a players head. If a player busted me on the first hand (my bounty would be $100), they would get $50 and their own bounty would increase by $50. As the event progresses, the bounties get bigger and the action becomes more exciting. Players still play for the prize pool. On sites like PokerStars, the bounty is paid instantly. Any prize pool reward is paid when a player busts, although this can vary depending on which site you play at. A 'limit tournament' is as the name suggests - played with betting restrictions, or limits. Unlike the more popular "no limit" tournament which has no betting limit, .i.e. you can move all your chips in at any time, a limit game has a betting cap and you cannot bet more that the limit allows. The structure of the tournament can either be a "knock out tournament " or a "Shootout Tournament". This is often more popular for new players as there is a relative amount of protection from going bust too quickly. A no-limit tournament is very popular whether playing online or live. The appeal of the game is largely down to the aggressive and risky nature of the game (you can lose all your stack in one hand). In a No limit tournament and you can wager all your chips at any time during the tournament. The blinds structure is not any different for a no-limit event and value betting becomes far more common than in limit games. Visit our poker games section if you want to find the best no limit rooms. We have them all listed and compare each of the rooms for a number of key features, each with a dedicated room review. Satellite tournaments are ever more common these days largely thanks to the rise in popularity of the World Poker Tour and World Series of Poker both of whom offer online qualifying opportunities to their top events. A Satellite tournament is simply a feeder to a larger tournament. If you want to play in a major tournament, let's for the sake of argument assume the WSOP, you have 2 options. Firstly you could just buy directly into the tournament which would set you back a cool $10,000 or you could look to get into the event for much less. To do this you could play an online satellite event or qualifier which will give you the chance to win a seat for the buy in amount of the qualifier (this can be anything up from as little as $1!). The only catch is that you will likely have to win the satellite or place in the top few places. Many top players try to qualify on the cheap, playing a few satellites, before buying into an event to see if they can get in for a fraction of he buy in. A shootout tournament is slightly different in structure as the players are not shuffled around to balance tables as players are knocked out. Each table plays until there is one winner per table. All the winners then play against each other until there is one overall winner. This type of poker tournament is not used on poker rooms online with standard poker room software favoring the knockout tournament. When you begin a tournament you usually get 1500 starting chips. A re buy tournament allows you to buy another 1500 chips within the first hour as long as your chip count is less than 1500 (or below your starting amount). This option is available for the first hour only (usually, although sometimes an hour and a half) followed by an ad-on on the hour. Usually after the first hour there will be a short break, once tables have completed play, and all players in the tournament will have the option to purchase an ad-on. The add on is very often an amount over the starting amount and gives players the option to increase their stack before play continues. After the break, the re-buy time will expire and the tournament would then become a knock out event. There is a lot of players that do not like the re-buy option as it induces a lot of loose play. The fact remains that many of the top tournaments played around the world feature re-buys so rightly or wrongly, it is still a common part of the game. On the positive side, loose play means the chance to build a decent stack at the expense of the idiots at the table that appear to have deep pockets and chase a mere sniff of a decent hand. Poker Tournaments - What's the Appeal? There are many reasons for the popularity of poker tournaments and satellites. Poker is the one sport that stands out from all the rest for the simple reason that you don't need to be a professional to play with the professionals. All you need is enough money to pay for the "buy in" and you get your seat. This is part of the attraction amongst players and with an abundance of opportunities to get into these events for a very modest buy in satellites, well, do you need any other incentive? Additionally, tournaments are a great way to play poker knowing exactly what it will cost you to enter, and knowing you won't be risking more than you buy-in for (unless a re-buy tournament). It is very different from taking your bankroll to a no limit table where you have the option to bring more chips to the table should you bust out. A no nonsense guide on how to play the game. Ideal for beginners looking to take the first steps on learning the game. We have a range of new player bonuses that will get you a bigger bonus that if you visited the site direct!